Today: These two dishes that might not be the most authentic recipes you've ever made, but that doesn't make them any less satisfying. Olympics season is upon us, and that means two things: feeling inadequate about your own athletic skills, and cultural exchange. We're taking the Olympics as an opportunity to dabble in foods inspired by other parts of the world. 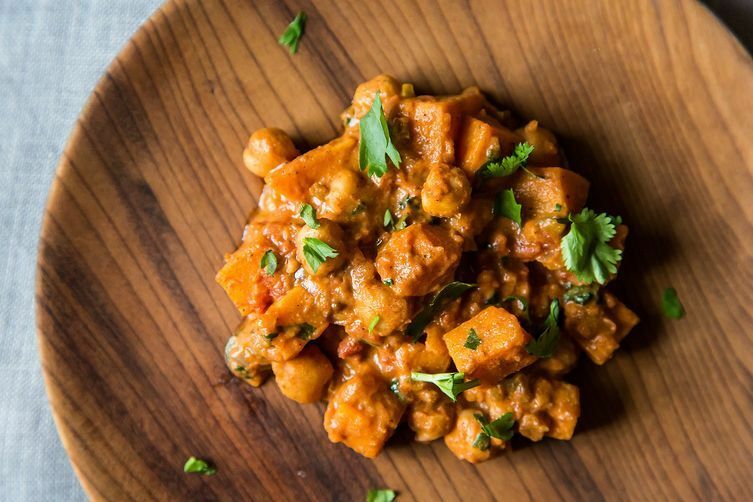 Sure, the chances are slim that you'll find sweet potato chana masala at your favorite Indian restaurant (let alone in India) or that your 10-minute, 3-ingredient version of bananas in coconut milk tastes like what you'd get in Thailand. But just because these two dishes might not be the most authentic recipes you've ever made doesn't mean they're not delicious in their own right. Tonight, let's be grateful that the sweet potato goes so wonderfully with Indian flavors, that coconut milk is common in U.S. grocery stores, and that figure skating is on TV. 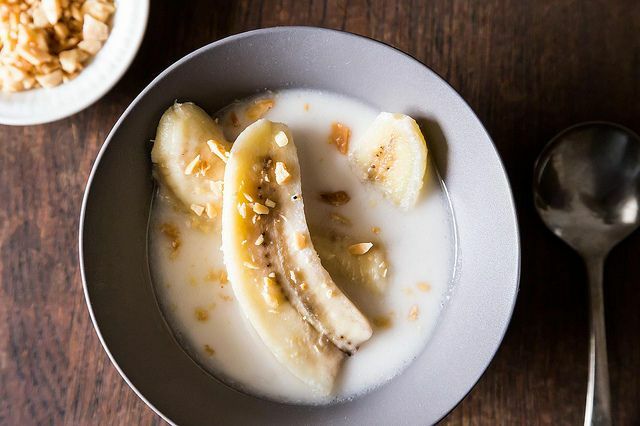 You probably have garlic, cumin, cardamom, salt, sugar, and toppings for the bananas (chopped almonds, sesame seeds, or cinnamon) in your kitchen. If not, add those to the list. 1. Prepare your ingredients. Dice the sweet potato and the onion, mince one garlic clove, and seed and mince the serrano chile. Grate 1/2 teaspoon of the ginger and roughly chop the cilantro until you have 1/4 cup. Set all of these ingredients aside. 2. Steam the sweet potato in the microwave with 1/4 cup of water for 3 minutes. Drain and set aside. 3. Heat the clarified butter in a saucepan, add the onion and garlic, then sauté over medium heat until caramelized. 4. Add the coriander seed, the garam masala, and 1/2 teaspoon each of cumin and cardamom. Add the grated ginger and cook for a minute or two. Then add the chile and cook for 2 more minutes. 5. Pour in the garbanzo beans, tomatoes, sweet potatoes, and 1 teaspoon of salt. Bring to a boil, then gently simmer, covered, for 15 to 20 minutes. 6. Remove the cover, stir in the yogurt, and cook for 5 more minutes. Heat up the leftover pasta or rice you have in the fridge, then feast. 7. Slice the bananas however you prefer. Warm the coconut milk in a saucepan with 1/2 tablespoon of sugar and a pinch of salt over low heat. Add the bananas and cook for up to 10 minutes (the longer you cook, the mushier the bananas). Dish into bowls, garnish with whatever toppings you've got on hand, and dig in. What is a pint of crushed tomatoes?? Canned or fresh? If canned, what size can? Beautiful recipe! Love the use of coconut milk! Bananas in milk is a signature dish associated with South Indian Weddings. The Bride & groom are seated side by side on a swing and are fed this by all the older married women from both families. Thanks for evoking Nostalgia from my big day! I had no idea! Thank you so much for sharing!